I'm alive, yes hard to believe I know. So, what happened since I left the MTC? Well the flight took forever and I didn't get much sleep, but I was able to give out a Book of Mormon and a pass along card. I went with my district and some others going to the mission south of us and some going to Buenos Aires. Once we got there the international airport wasn't that impressive at all. After arriving we went to the Buenos Aires temple. Some people from the church were there to pick us up and then we went to the temple. After the temple we went to the hostel, it's called, and ate the food there that was a lot like spaghetti. After that we were going to go get pictures but weren't able to because the people that were to pick us up came like an hour and a half early. O well. We then went to the other airport that is for domestic flights only which was actually a lot more impressive. We then flew to Bahía. It was really dark at this time so it was cool to see Buenos Aires at night from the sky. My pictures didn't turn out though. After arriving in Bahía we met our mission president and ya know, he doesn't speak any English. That was interesting. The next day we went to the office and filled out a ton of paperwork and such and then went to the stake center there. I got assigned to my new companion, Elder Rios. He is from Rosario which is in Argentina, but he speaks really good English. I'm in a little area called Rauch which is really small. The branch has about 40 members and the building is tiny! So as for castellano (that is what they call their language down here because it's a little different from Spanish) it isn't going great right now. I can't understand anyone. I can't really speak it any better either. But as I understand more, it will become easier to learn Spanish. Today is the 25th of May which is their 4th of July. We went to a branch activity for the branches here in Tandil (we have to come into Tandil for P-day because there is nothing in Rauch). They made this soup that is kind of good but looks terrible. They throw just about whatever in it. The food in Rauch, because it is a "field community", doesn't consist of a ton of beef like most everywhere else. This companion thing is kind of getting ridiculous. My companion; he's interesting; he works hard but has had some issues with a lot of rules so I'm really trying to work with that strength that he has. He was literally watching the movie Twilight my first day. So the next day I had our companionship study on obedience and such and he's doing better. We're in an interesting position in Rauch. Every door has been knocked on in the past month or so and now we don't really have anywhere left but we were able to get 4 investigators to church, which is great. We also got two baptismal dates as well. So we're working on referrals only now. It doesn't look like you're going to get pictures today as I can't figure the camera and computer out. The computer popped up for a second but now it isn't there and I can't fix it because it is all in Spanish, and this keyboard is terrible! Letters take 3 weeks to get here through dearelder.com, but send them anyway! Our family had the choice opportunity to talk to Elder Sands from the Dallas/Ft. Worth Airport while he was waiting to fly the final leg on his way to Argentina. Elder Sands and nine other missionaries from the Provo MTC will arrive in Buenos Aires at about 7:50 AM Tuesday, go to the Buenos Aires MTC and probably have an opportunity to attend the temple there. They will then be picked up to ride about another 450 miles to finally arrive in Bahia Blanca. This belated Mother's Day call revealed what Elder Sands has so quickly become; polite, articulate, humble, obedient, and spiritual. He is ready to serve! His letters and pictures from Argentina should start being received next week. We will post them as they become available. I don't have the flight numbers with me right now, but I'll try to send them today. I have all day to send them I just need to keep track of the time I have left. As for emailing me out in the field, you'll need to email me through the myldsmail.net because that is the one that they want us using as it is "church approved". Also, I'll be allowed to call you in the airport especially because of Mothers Day. I'll call Karyl first at about 5 or 5:30. I'll talk with her for a while and then call you at around 5:30 to 6 because I want to be handing out stuff while I'm in the airport and maybe get in a few lessons! We had another apostle again. Elder Nelson came on Tuesday and it was a fantastic talk although really short. He spoke 20 minutes less than he could have but it was still great. He talked about a lot of different things, but thankfully I like to get to devotionals early and so I was 10 rows away and had a great view. He will have been the 3rd apostle to come here while I was here. Most only get one or two. However, for Elder Barnett that is four for him. I missed Elder Perry by one day. I told him that I was leaving Monday. His reaction was pretty funny as he still has two weeks left. Poor guy or rather Elder. I can't wait to get to Argentina. You know I loved the MTC, but everything about here is meant to get you ready and excited for out there. I had an interview with Hermano Crane (my teacher who severed in Buenos Aires) and I asked him what are some things he wished he would have done better on his mission and his responses really inspired me. I'm really looking forward to doing the things he's suggested and everything else I've learned here and applying it out there. Thank you for all of you letters. Keep writing me through dearelder.com, it's easy and free. Thank you all again for your love, support, Christlike examples, and everything you've taught me. I leave Salt Lake, Monday, May 18 at 12:05 PM on American Airlines flight 1862 and arrive in Dallas/Ft. Worth at 3:45 PM. I leave Dallas/Ft. Worth at 7:35 PM on American Airlines flight 997 and arrive in Buenos Aires at 7:50 AM the next day. Well I have like 10 seconds left. Most importantly, Happy Mother's Day Mom! We weren't allowed to call from the MTC, but I want to tell you that I've learned everything I know and am using out here from you and Dad and I thank you so much for your amazing Christ like example for me! I love YOU! Karyl I met or rather taught someone who knew you from your mission. Her name is Sister Jones and she was born a few months I think she said before you, and by the way, it was a fantastic lesson. Also I need about 300 in my account and don't freak out about how much I'm spending. I think that's it. I just have to pay for dry cleaning, some clothes and the last thing is a water bottle that the church officially recommends to us, so I got that too. Exciting News I got my flight plans! So I head out to Argentina Monday! So one more update from the MTC after today. I fly out of Salt Lake at like 12:00. I won't get to detailed today; I'll send more details on Thursday. I get to Dallas at around 3:30 their time (I think). I have about a three hour layover there and then straight down to Buenos Aires. I Leave the US at about 7:30 (again, I think) and arrive in Argentina at about 7:30 in the morning their time. So a very long flight. I decided I'm just going to read the whole time. I can't sleep on a plane. I'm hoping I'll get to go to the temple down there before we head to Bahia Blanca. Thanks so much for the letter Brother Borders! I really enjoyed it. It's awesome that you're now going on calls and such. Ok sorry about that. I had to change rooms. Ok, were was I? Oh ya, Karyl, can you send me some pictures of you and of the family please. I realized that I don't have any except for one that Shiloh sent me. Barb thanks for the letter. It doesn't seem like very long at all, but it's been two months as of Monday. And for anyone who writes me I'll send something back whether it is through the blog or by letter as soon as I'm able, so don't worry about that. I'll get the mission address on here for Thursday too. Well I'm not as ready for Argentina as I would like to be, but I'm ready to leave here for sure. The breakfasts for example are all the same and starting to get a little boring, the other food however I'll miss. So we've been, well I've been, playing beach volleyball in gym because they're updating the gym and it is so much fun. I found out something, I'm a really good digger and my setting is alright but I can't spike at all. What's really funny though is that I'm always the one with the dramatic dives into the sand (arana in Spanish) and so everyone is calling me Elder Arana is in the arana again hahaha. So apparently I'm going to be called Elder Arana a lot down there according to my teachers, so some Elders in the Zone call me that all of the time now. It's a little weird but I'm starting to answer to it too now. It's amazing how much we have to rely on the spirit as missionaries and as I rely more on my faith and in the spirit, I really teach to the needs of the investigator. Whenever I do that, things go so much better. However, sometimes I'll find a scripture, for example, that will work really well for something, but I'll get a little too attached to it and want to use it for everyone. I have to then remember that what I'm learning may not be for everyone, it is just another tool that the spirit can tell me to use when appropriate. That is something that a lot of missionaries don't seem to realize. They just want to teach the lessons as outlined exactly in "Preach My Gospel" and that's not the best way. It shows a lack of faith in the Lord and how he will help us as we do those things that are required for his help (D&C 82:10). So we need to let go of our will and follow his (Prov. 3:5-6). Thank you all for your support and love! Well these last two days haven't been extremely eventful but there were a few noteworthy things that happened. One of which was Elder M. Russell Ballard showed up for our devotional on Tuesday. That was really spiritual to have an apostle talk specifically to us as missionaries. I also got to be in the choir for the last time here (they're fixing up the gym/auditorium) so I got a good seat. It is an amazing thing to hear the testimonies of the apostles. He talked about how we need to have a desire to do, especially as missionaries. However this counsel applies to everyone. If we don't have a desire, what will happen, nothing! In fact there is this one investigator (in the TEC, so a teacher here) who realized that after we gave her Alma 32 to read. In verse 27-29 I think it talks about how we need to have that desire and then act upon it. She wanted to have a better relationship with God and was wondering why she didn't and she realized that she needed to do something about it. So now she is on date to be baptized! Although she (the teacher in teacher mode) mentioned she was going to throw a curve ball at us and we teach her tomorrow. Oh yeah this is in Spanish now so I was really thrilled with the way we have been teaching. I don't know if I mentioned this before but all of the grammar I've been learning just kind of clicked and now my Spanish has more or less caught up with everyone in my district almost overnight. That is the difference the Lord can make. So today I broke down and got myself an English hymn book. I realized how much I missed them when I was at the devotional Tuesday night. You know the hymns can be so inspiring and I practically consider them scripture. I encourage all of you to read out the hymn book every so often just to read it. In fact if I might recommend one that we sang a while ago that really touched me is "The Lord is my Light." A lot of these aren't in the Spanish version and due to the translation it doesn't flow as well in Spanish. We are so blessed to be members that know English. There is really very little that is done in other languages and we are so blessed to have all of it. In fact the Spanish bible that is coming out in September is not an LDS edition. They had trouble with copyright issues for a long time but now the Spanish speaking people will finally get to use all of the standard works with the topical guide and bible dictionary which are amazing to have. I use them so much! Also today, hopefully, I'll be getting my flight plans which I hope I leave Wednesday or Thursday so I'll get you my address when I can. I don't have it with me now. And I think all that is required for actual mailing of a letter is two stamps and it has to be less than one ounce. But you can still use dearelder.com to mail me and it will get to me in Argentina fairly quickly, so I've heard. We are all missionaries and we need to act as such. The Lord expects a lot from us, but as Nephi said, the Lord will prepare a way to accomplish what he wants us to do. We are His work and His glory. That means a lot to me. That everything he does is for us to become better and to have happiness. So Sebring you took the SAT and you did well. That's exciting! Tell me the results as soon as you get them ok! That is great to hear about Bryton. 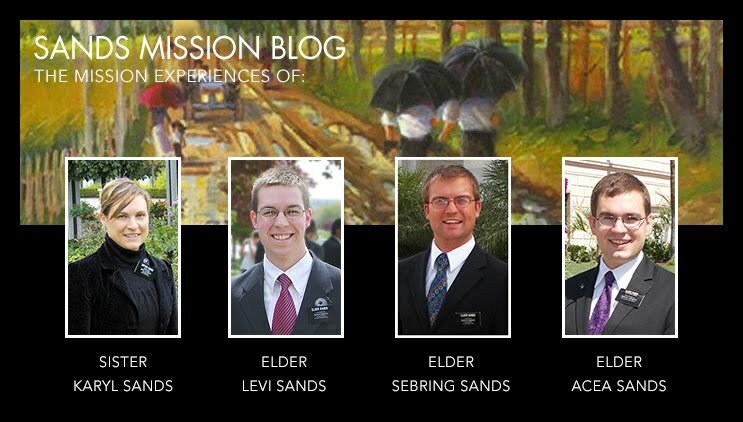 It is really inspiring and because of his determination he'll be a great missionary. I know I won't be able to call for mother's day. Not in the MTC, so sorry but maybe if I have time in the airport. I don't know if it is allowed but I'll have to ask someone. It's amazing to think it's already been 2 months. I can't wait to get to Argentina though. Paul Hawkins, that is so exciting about your mission call. You'll have a lot of fun with the language. We have all of the Japanese missionaries right above my class room and it's tough because of the differences. It's really hard to go from English to Chinese. You'll have a blast though! It was great to hear from the Lepperts and thank you so much for the advice. I'm learning a lot from my campainon and I know that I'm going to be a better missionary because I was assigned as his companion. Now to finish a Day at the MTC. During class is where I think I'm at. During class we work on Spanish mostly. We actually just got to past subjunctive yesterday, which is supposedly the hardest grammar principle to learn in Spanish. I understand it now. The hard part is using it in my Spanish. My Spanish by the way, has kind of clicked in. I happened about two weeks ago. Before that I was not getting anything. I wasn't able to talk much in Spanish and I was struggling with understanding people in Spanish (well that's still really hard for me for some reason). But all of the sudden, all of the grammar I had been studying so hard, just came together and now I'm able to speak it alright. Now I just have to add subjunctive and a few other tenses into my speech, and really work on my vocabulary and I'll do alright (I probably won't be saying that in Argentina however). The Lord has helped me so much in this. I know that through the spirit I have learned almost all of the Spanish I know now. Without the spirit I would still be using almost no Spanish only Lo siento. Aso in class we will go over gospel topics and how to teach and other things in PMG. That stuff isn't so hard because it is in English so I feel pretty comfortable there, though I have a lot to learn that's for sure, but I know enough to get around if you will. After class in the afternoon is dinner which is pretty good here. Almost all of the food I really enjoy! I still haven't gained any weight which is good, but I eat a lot. After dinner is most of the time another class with a teacher. After that time on Tuesdays and Saturdays we have service which is now about to change. The MTC is getting some major updates in a lot of areas and now the gym is getting that. So, I'll be missing the inside gym for the rest of my time here. But for service we used to set of chairs, put down the mats, and set up the stand. I have some videos on my camera of us doing this. Eventually I'll get those sent. Now we have to do chairs in 1M which is the main building for administration and stuff. I have no idea how we're all going to fit in there but that's what the rest of my district was saying. I hope there will still be choir. It is really great to go to choir here. The conductors are amazing and I get to get away from my district for a little bit. After service, or I should say before service, we will have planning. Planning here I'm sure is quite a bit different than out in the field. I keep Elder Stout and I busy with tons of teaching appointments. We have 16 just by ourselves and we both need two more with other missionaries in the district. After planning we go back to the residence which I have to say sometimes is really annoying. You'll be full of the spirit and then you'll go back and everyone will be just messing around the entire time, and just killing that spirit. So I do my best to try and engage in activities that keep the spirit. Oh I forgot devotionals. But I'm running out of time so I'll talk about them next time. Keep the spirit with you always and you won't do hardly anything you'll regret. Thank you for all of your letters love and support.